Given that several birds roost on the site and alight early at first light, there is the possibility of birds having ingested particles of white phosphorus during early feeding, only later to succumb to acute effects elsewhere. Potentially as could their predators carrying prey off site. 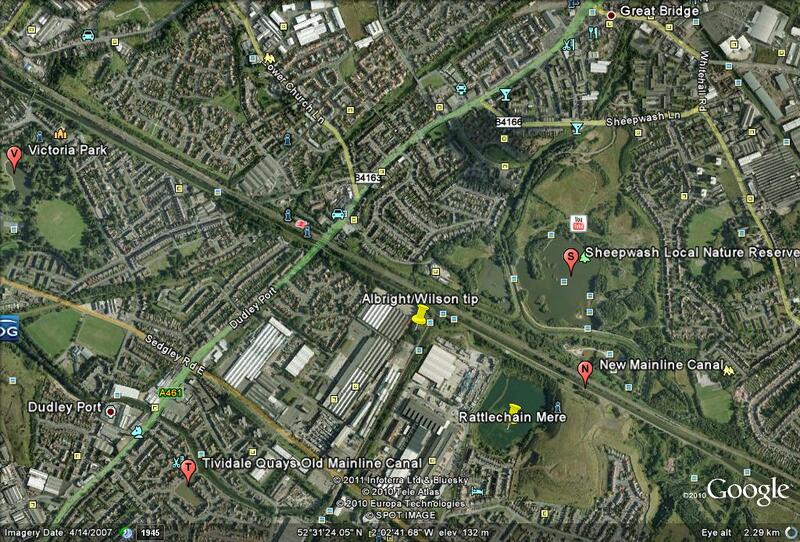 A swan that had been at Rattlechain lagoon 0n 7/2/01 with a clear colour code darvic leg ring number having been read in the field, was subsequently found dead on the Old Mainline canal near to the Tividale Quays the next day. Although no formal post mortem was carried out, as with the dead birds at rattlechain, there were no apparent gross external signs of injury or explanation for its sudden death. 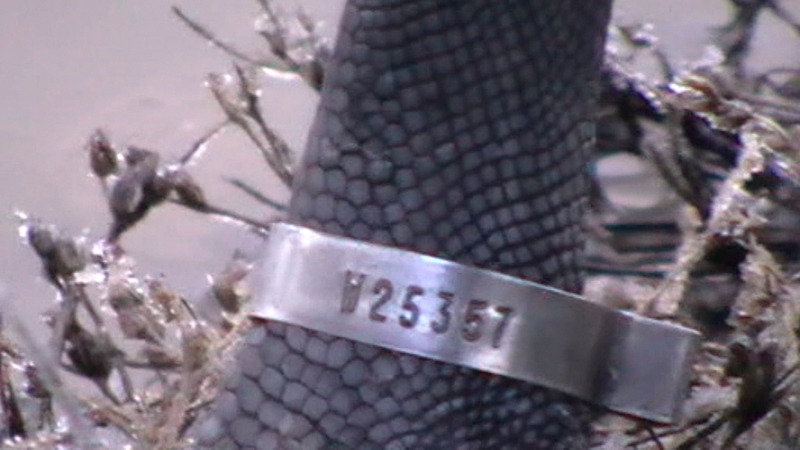 It is possible to study individual birds in this way by recording their leg ring numbers. Some swans have a plastic darvic ring consisting of numbers and letters. 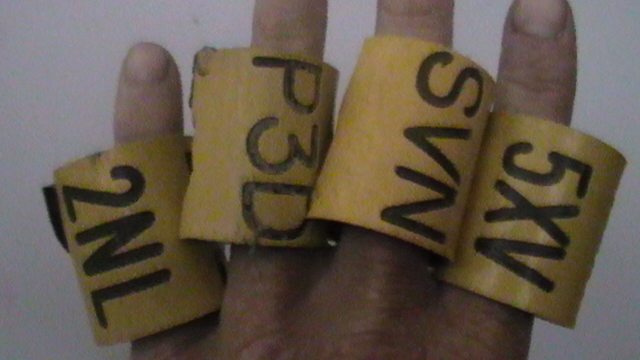 They also may have a British Trust for Ornithology metal ring- these are shown below. Some canada geese in the Midlands area also have rings. Whilst they offer a valuable observational tool, their brittle PVC nature makes them easily crack, and they have been responsible for several incidents of needless damage to birds feet and legs. Birds have been noted by us as well as other observers to fly many miles between sites, and sometimes between surrounding counties. 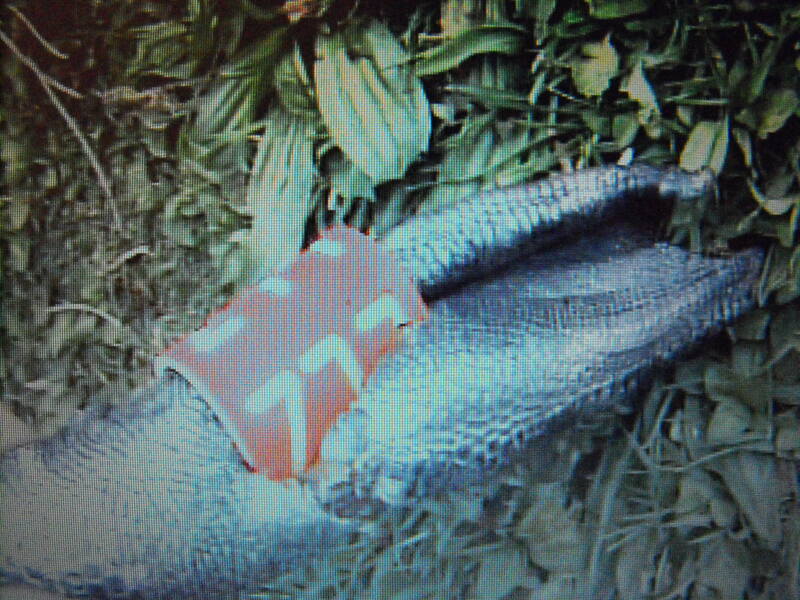 We know of some that have left the Rattlechain site and have been seen in Tamworth, Lichfield- a distance of around 20 miles. THIS THEREFORE DEMONSTRATES THAT SWANS AS WELL AS OTHER WILDFOWL CAN GET ABOUT QUITE A BIT- JUST LIKE PEOPLE. There has in the past been anecdotal evidence of unexplained bird deaths on the Tividale Quays on the Old Mainline Birmingham Canal. Though swanwatch have not been involved with the removal or examination of carcasses, British Waterways now known as the Canal and Rivers Trust routinely remove animal carcasses from the canal system, whereby they are incinerated. Similarly park staff at the countryside sites in Sandwell and surrounding boroughs and also waste contractor SERCO may remove carcases from Local authority controlled waterbodies. 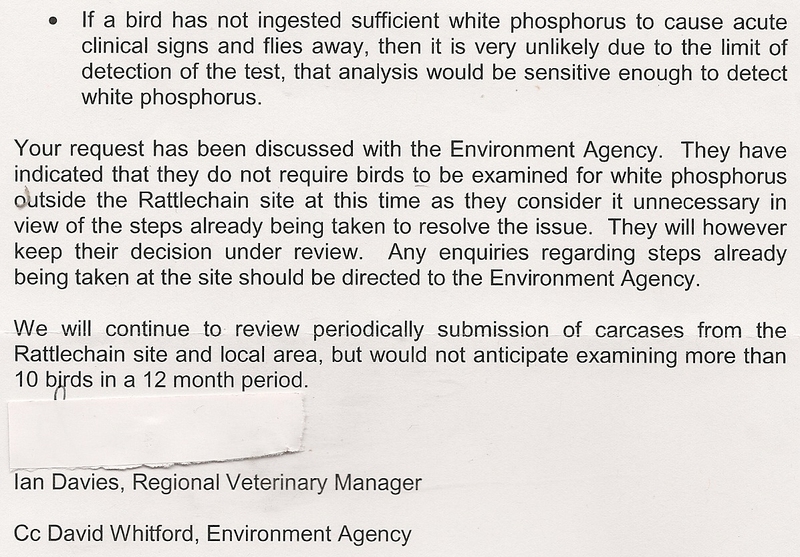 The RSPCA are also likely to have removed ailing birds from these different areas, but with no information concerning white phosphorus poisoning available to them why would they have ever suspected the cause to be from a different site, or have known the symptoms associated with p4 poisoning? There have been numerous dead Canada geese found at other local sites in addition. Though these deaths may be explained away by “natural” or other causes, it is important to note that the deaths on Rattlechain were in the same way dismissed in this regard by people who have now had to reconsider their dismissiveness in the face of scientific evidence- i.e The Environment Agency and The Veterinary Laboratories Agency. Below is a map of sites within 1km used by wildfowl near to Rattlechain Lagoon known as “Rattlechain Mere.” by Rhodia when they were trying to disguise the toxic legacy that it contained. Though we have yet to observe clinical signs of white phosphorus poisoning in wildfowl not on Rattlechain lagoon, we strongly suspect that deaths have occurred off site from white phosphorus poisoning and that post mortems and tests for white phosphorus on these birds should be being carried out. IT IS IN THE PUBLIC INTEREST TO DO SO- AND WOULD THUS PROVE THAT WILDFOWL DEATHS ARE NOT CONFINED TO THE CONTAMINATED SEDIMENTS OF RATTLECHAIN LAGOON. Given the proven toxicity of white phosphorus poisoning wildfowl on Rattlechain pool, it also has to be asked as to whether these birds or their secondary predators can leave this site to die elsewhere. Evidence for this would need to be tested for ”direct evidence” by testing dead animals off site for white phosphorus exposure. 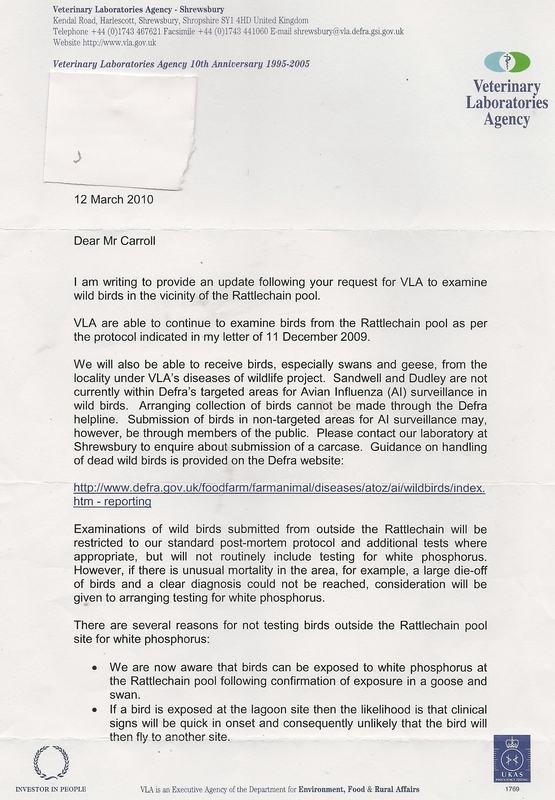 Typically when asked about the feasibility of retrieving recently dead birds from other sites for P4 testing, once again the VLA and Environment Agency do not appear to want this evidence to be tested. We are now aware that birds can be exposed to white phosphorus at the Rattlechain pool following confirmation of exposure in a goose and swan. If a bird is exposed at the lagoon site then the likelihood is that clinical signs will be quick in onset and consequently unlikely that the bird will then fly to another site. By this he refers to the untested success or failure of the geotextile membrane laying scheme being carried out as part of Rhodia’s closure of the site. SO FAR NO STEPS HAVE BEEN UNDERTAKEN TO RESOLVE THE ISSUE AND THIS REPRESENTS YET ANOTHER DENIAL OF SCRUTINY OF THE TOXIC LEGACY OF THE RATTLECHAIN SITE . Marianne Walsh, a key player in The Eagle River Flats investigations into wildfowl mortality and the site remediation, has made the following comments regarding exposure to wildfowl and their subsequent manoeverability.